Is the real future for VMware in one of its quietest releases? VMworld 2018 once again proved to be one of the biggest technology events of the year, yes you can point out Dreamforce and OracleWorld and Microsoft Ignite as potentially larger but VMworld is still a ~20K person conference and ranks as one fo the larger ones around. Its also no surprise that VMware takes the time to make major product announcements during the show to make it exciting and get the user base hyped for another year. This year I heard alot about how the release of Amazon RDS Services natively in a private datacenter and connected as a custom region in AWS was the biggest news. While I I do believe this is a great thing for many enterprises and specifically cloud first companies, I don’t think it will be the release that has the largest impact on the future of VMware. Welcome vSphere on ARM! Yes ARM, that little processor you hear about for cell phones and IoT devices. This was touched on in one of the keynotes and I think alot of people just thought it was a gimmick and since there is no firm release date, thats reasonable but lets for a moment take a look at a few places that vSphere on ARM could have a huge impact. Build the VM with all the virtual disk you would like and install an OS. Keep the defaults as you add disks. If you add additional disks before powering on, make sure they are at the default as shown below. Make any configuration changes you need within the core OS. If you want things on secondary disks to be static when reset, make those changes now also. You can not make any changes you want to the VM, even allowing users to make changes involving multiple disks. To reset the VM to the clean state that you built, simply go to vCenter and power cycle the VM. Note: If youhave any snapshots you can not change the disk style. You will need to delete all snapshots and consolidate if you want to set this. Over better part of the last ten years, I have been involved and benefited from one of the largest business communities that I have ever seen. Revolving primarily around the VMware ecosystem, this community has provided me with access to some of the smartest minds in systems administration, business leaders and I have made numerous friends, but alas I think it is all about to fall. To even start to explain where I am coming from lets first take a step back and explain some history. I started working with VMware based products somewhere around 2004 or 2005 with GSX Server. As time progressed I worked more and more with virtualization and was even offered a job after and early VMware User Group(VMUG) meeting. That turned into a stepping stone that began to escalate my career path. I moved from a standard admin to management and then shifted over into being a sales engineer. During my first role as a sales engineer for a regional reseller I began to participate heavily in the Community Roundtable Podcast, a very early weekly podcast hosted by John Troyer. Combined with the VMware community forums I had access to tons of resources and people. Things we progressing great and I moved into more VMware centric roles and eventually moved over to the vendor side. This move was all because of relationships I had built with this VMware community. The community had grown and so had my involvement, 5 years ago I started hosting a daily podcast at VMworld with some of these community member that I still do today. It was during one of these podcasts this year in San Francisco that I had a few other guys confirm feelings that I have been having for the past year, that the VMware Community has gone too commercial and lost the camaraderie and independence that made it so special. Vendors used to spend small amounts of money to help get people together with the knowledge that their name would be shared and these influential bloggers and social media activists would in turn support them (if their product was worthwhile). Events were created by individuals and anyone could show up and be welcomed regardless if they worked for a vendor. If you were active with a certain group it did not matter if you filled out a form on a website to give the sponsoring company a fresh lead, you were welcomed into events with open arms. Times have changed and while I still have many great friends and contacts I dont think the community as I knew it exists anymore. We have groups of people recognized for their participation in the community, vExperts, that many even with the group have become too entitled and it is no longer a group that provides feedback but rather just wants free swag. We have events that were once only ran by the community and were open for anyone that are ran by corporate marketing teams and are no different than if a customer appreciation party. There are very few new blogs or known technical talents that are being publicly lauded for their work and those that remain are often now so entrenched in their circle of friends that it is nearly impossible for a regular customer to make a connection with them enough to feel like they are becoming part of something. There are still a few events that are driven for the community and managed in a way that any sponsored money and invitation goes back into the event but the feel and the vibe is slowly dying. This VMworld I was lucky to be involved with VMUnderground which while much bigger than the founders or any of us involved ever expected still goes back to making sure people meet each other and see sponsors logos and hopefully is mutually beneficial. Community packages were built for sponsors around participation in the vBrownbags, a series of hopefully no FUD short talks, Spousetivities, the definition of work-life balance and of course VMUnderground and vRockStar and the sponsors seemed to feel they are getting good value by participating. I also got to see a much smaller event like The Gathering with only about 35 people be very well attended and produce great value for all involved. Something that allowed community members and sponsors intertwine and even allowed community members that had not meet were able to. I am not going to list off any of the events that I heard were not as accommodating or as focused on the attendees as I only hope they already received that feedback. What I will say is that I hope as we move towards VMworld EMEA in a short 5 weeks everyone involved in the community finds a way to meet someone new, find a vendors they think is amazing and support them, and welcome that new talent that has allowed our industry to grow. The community is not about a number of leads but rather about a network of people helping people. Lets not let that fail! For what I believe is the 5th year in a row(might be the 6th, I have lost count), I am excited to be hosting a daily talk show and podcast with some of the most influential and intelligent people in virtualization. The VMware vExpert program recognizes the individual contributions of geeks, nerds and the like to support the virtualization community. Starting from a small corner of the community area with the help of John Troyer(@jtroyer), the show the next year turned to the anchor program of the vBrownBag Live celebrating other community members and supporters. This year is no exception, we have locked in the line up for San Francisco and will have some great guests, this is a light hearted and casual review of the days activities and announcements that follows the keynote. If you want an honest opinion with less FUD and sometimes even a little disgust with announcements make sure to watch the live stream at 10:30 PDT each day. I am working on deploying some new VMs to demo some of the latest Nexenta products but I found one issue instantly. The deployment requires 10 Gbps networking and since it is all internal to my macbook I assumed this would be easy. Unfortunately VMware Fusion 7 does not have a graphical way that I can find to change the type NIC. Turns out this is very easy and I thought I would share the process so here goes.. Build the VM with whatever number of NICs you need. 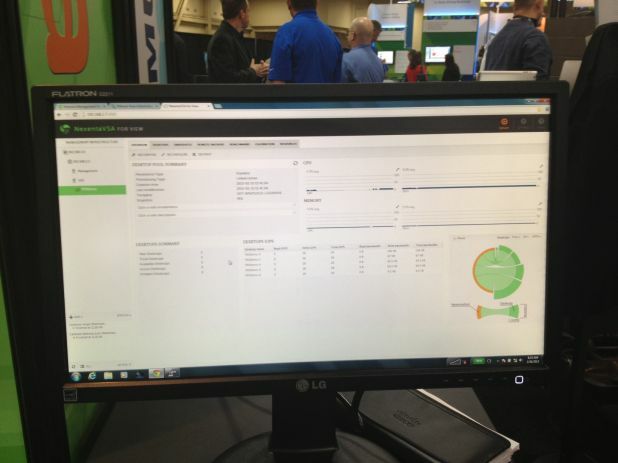 Those of you that got to make it out to the VMware Partner Exchange probably got to see the demo in the Nexenta Booth. 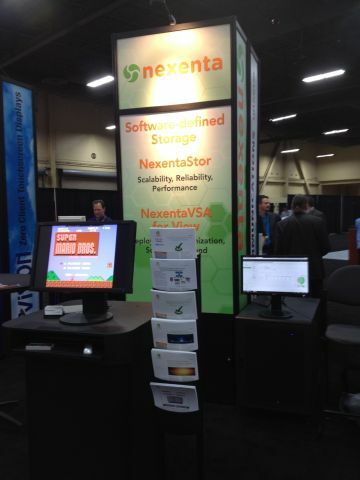 Alot of the common social media geeks around virtualization got to swing by. Chris Wahl from WahlNetworks included. This was not an overly complex demo, but I wanted something fun to show off VDI sessions. Using the real time performance metrics that are shown in NexentaVSA for View, we can actually see the systems running. The install was rather easy, with one caveat. 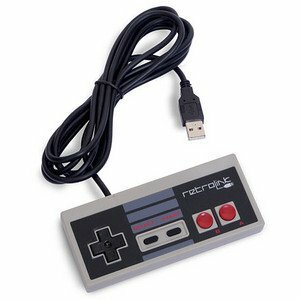 VMware View does not recognize the Classic USB NES Controller for PC that we picked up from Amazon. The great part is on the Lenovo Thinkpad I was using as a client I can make just a quick registry change and View will recognize. This process is detailed here, very similar to restricting access, this allows you to add unknown USB devices to share to your View session. The hardware was not very intense for the servers. A couple Dell 1950 running ESX5.1 and using a Supermicro server with Nexenta installed as shared storage presenting 1 TB of NFS storage. For the VDI hosts I put in 2 Cisco UCS C200 M2. By adding in a single STEC ZeusIOP and a single spinning disk to house the desktops, and 96 GB of RAM we are able to build a rather robust VDI setup. Allowing for about 100 desktops all being deployed with NexentaVSA for View..
By adding in the JNes Nintendo Emulator to the Windows 7 base images and VMware View Linked Clones, we have our own mini arcade. For the second year in a row, I have been given the distinct pleasure of anchoring the VMware Communities TV lineup at VMworld. If you are not able to make VMworld, why not spend less than an hour a day and hear from some of the leaders in the virtualization community talk about everything that is announced and all there is to see at the conference? If you have more time keep watching for some great tech talks throughout the day. Our format is simple, a very casual conversation each day starting at 10 AM PST with myself and then 3-4 VMware vExperts. The topics will be varied and will probably cover everything from the latest VMware releases to the best releases from vendors to how the welcome reception and evening. Take a look below at the listing of the vExperts currently signed up and make sure to click on their names to follow them on twitter. You never know who else might stop by though.